Sunlight is the main source of blue light, and being outdoors during daylight is where most of us get most of our exposure to it. But there are also many man-made, indoor sources of blue light, including fluorescent and LED lighting and flat-screen televisions. Most notably, the display screens of computers, electronic notebooks, smartphones and other digital devices emit significant amounts of blue light. The amount of HEV light these devices emit is only a fraction of that emitted by the sun. But the amount of time people spend using these devices and the proximity of these screens to the user's face have many eye doctors and other health care professionals concerned about possible long-term effects of blue light on eye health. 2. The eye is not very good at blocking blue light. Anterior structures of the adult human eye (the cornea and lens) are very effective at blocking UV rays from reaching the light-sensitive retina at the back of the eyeball. In fact, less than one percent of UV radiation from the sun reaches the retina, even if you aren't wearing sunglasses. (Keep in mind, though, that sunglasses that block 100 percent of UV are essential to protect these and other parts of the eye from damage that could lead to cataracts, snow blindness, a pinguecula and/or pterygium, and even cancer.) On the other hand, virtually all visible blue light passes through the cornea and lens and reaches the retina. 3. Blue light exposure may increase the risk of macular degeneration. The fact that blue light penetrates all the way to the retina (the inner lining of the back of the eye) is important, because laboratory studies have shown that too much exposure to blue light can damage light-sensitive cells in the retina. This causes changes that resemble those of macular degeneration, which can lead to permanent vision loss. Although more research is needed to determine how much natural and man-made blue light is "too much blue light" for the retina, many eye care providers are concerned that the added blue light exposure from computer screens, smartphones and other digital devices might increase a person's risk of macular degeneration later in life. 4. Blue light contributes to digital eye strain. Because short-wavelength, high energy blue light scatters more easily than other visible light, it is not as easily focused. When you're looking at computer screens and other digital devices that emit significant amounts of blue light, this unfocused visual "noise" reduces contrast and can contribute to digital eye strain. Research has shown that lenses that block blue light with wavelengths less than 450 nm (blue-violet light) increase contrast significantly. Therefore, computer glasses with yellow-tinted lenses may increase comfort when you're viewing digital devices for extended periods of time. 5. Blue light protection may be even more important after cataract surgery. The lens in the adult human eye blocks nearly 100 percent of the sun's UV rays. As part of the normal aging process, the eye's natural lens eventually blocks some short-wavelength blue light as well — the type of blue light most likely to cause damage to the retina and lead to macular degeneration and vision loss. 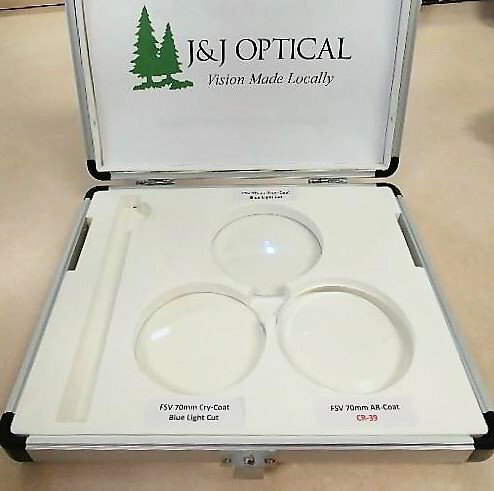 If you have cataracts and are about to have cataract surgery, ask your surgeon what type of intraocular lens (IOL) will be used to replace your cloudy natural lens, and how much blue light protection the IOL provides. 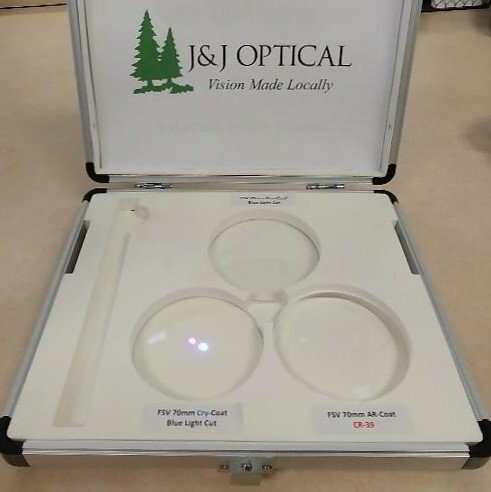 After cataract surgery you may benefit from eyeglasses that have lenses with a special blue light filter (which we have in stock)— especially if you spend long hours in front of a computer screen or using other digital devices. The above three pictures are to show the difference in blue light exposure to your eyes. The first picture is a normal plastic lens with a standard Anti-Reflective coating on it, not very useful for blocking blue light. 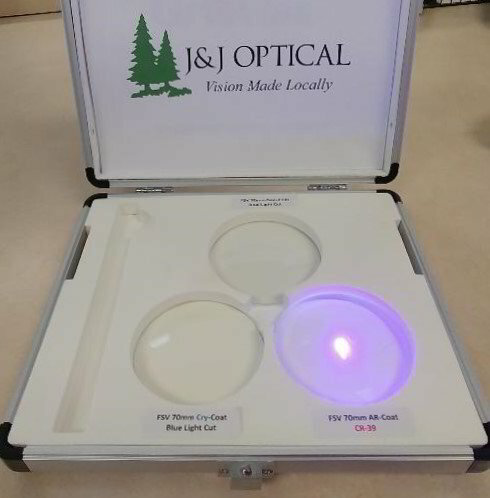 The second picture is a normal plastic lens with our Retinal Bliss Blue Blocking Anti-Reflective coating, much less blue light can penetrate through the lens (and our recommendation for anyone who is worried about blue light). The third picture is our Blue Blocking lens with our Retinal Bliss Blue Blocking Anti-Reflective coating, for even more blocking. Our Retinal Bliss Blue Blocking coating is a must-have for anyone on digital devices for more than an hour a day. It helps prevent digital eye strain and the headaches that come with that.